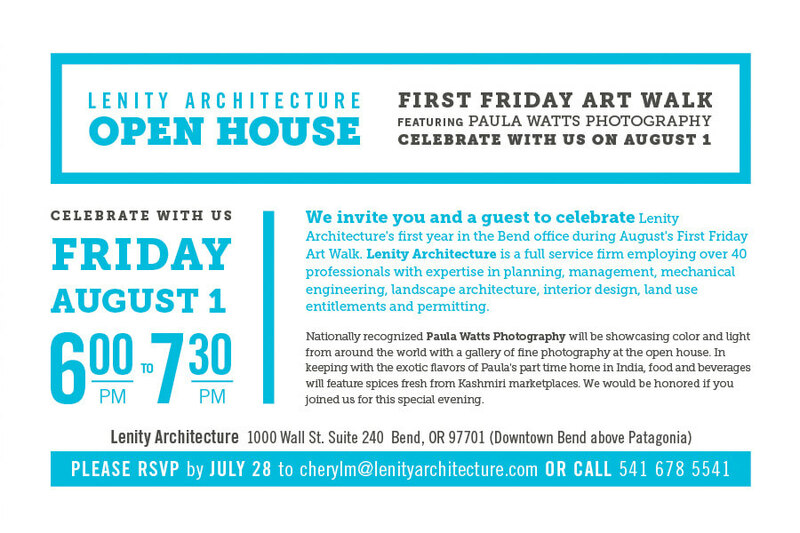 Lenity Architecture is hosting an open house to celebrate their first year in the downtown Bend office. The public open house is during the First Friday Art Walk, August 1st from 6:00-7:30 at 1000 Wall, Suite 240. Nationally recognized Paula Watts Photography will be showcasing color and light from around the world with a gallery of fine photography at the open house. In keeping with the exotic flavors of Paula’s part time home in India, light appetizers and beverages will feature spices fresh from Kashmiri marketplaces. Lenity Architecture is one of Oregon’s fastest growing companies, is a full service firm employing over 40 professionals with expertise in planning, management, mechanical engineering, landscape architecture, interior design, land use entitlements and permitting. Lenity Architecture’s main office is located in Salem, Oregon and the Bend office was opened as an extension of the firm’s fast-growing commercial division. Lenity Architecture’s experience spans over 35 years and ranges from commercial and medical architecture to senior living planning and design. Recently completed and ongoing regional projects include the major renovation of The Village at Sunriver, the remodel of the Sunriver Observatory, design of Bend and Redmond Dairy Queens and the World Sanford Clinic in Klamath Falls. Lenity’s senior living portfolio spans the US, Canada and England and includes nearly 400 communities. Paula Watts Photography a Bend-based professional photography company specializing in architecture and advertising imagery. Paula’s travels from the Northern heights of the Himalayas to the bottoms of the Australian ocean floors help provide a constant stream of inspiration for her work in the states. In an awe-inspiring journey of culture, beauty, adventure and life, Paula will be showcasing photography from around the world–including her most recent adventures in India. For more information about the open house, please contact Lenity Architecture’s Director of Marketing, Cheryl McIntosh, at 541-280-0086 or cherylm@lenityarchitecture.com. To learn more about Lenity Architecture, visit the website at www.lenityarchitecture.com. For a preview of Paula Watts Photography’s work, visit www.paulawattsphotography.com.